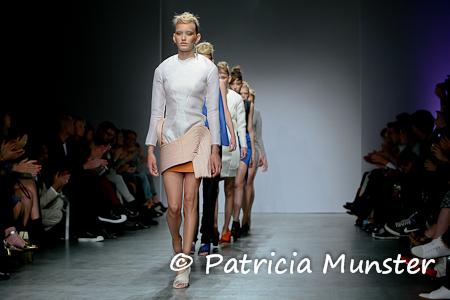 The second day of Amsterdam International Fashion Week Pauline van Dongen presented her collection 'Kinetic Landscapes'. The young designer was inspired by the abstraction that she discovered in nature's eroded appearance; her goal was to capture the strenght of two powerful elements - air and water - and their impact on our surroundings. Pauline collaborated with shoe designer Anna Korshun to create a distinct shoe design for this collection. 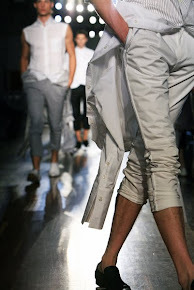 Leather was laser cut in curved lines that twist around the foot to reinforce the flowing nature of the garments. She also worked with Nathalie Tappin to develop pieces of jewelry with an industrial quality that contribute to the futuristic feel of the collection.